So, how hot is it where you live? We’re finally out of the hottest July in D.C. history, but the temps are still in the 90s and the humidity is back. The air kind of looks like this…. Couldn’t resist buying a bunch of sunflowers at Trader Joe’s because they remind me of Provence, my favorite place in the summer. The light there is unmatched. 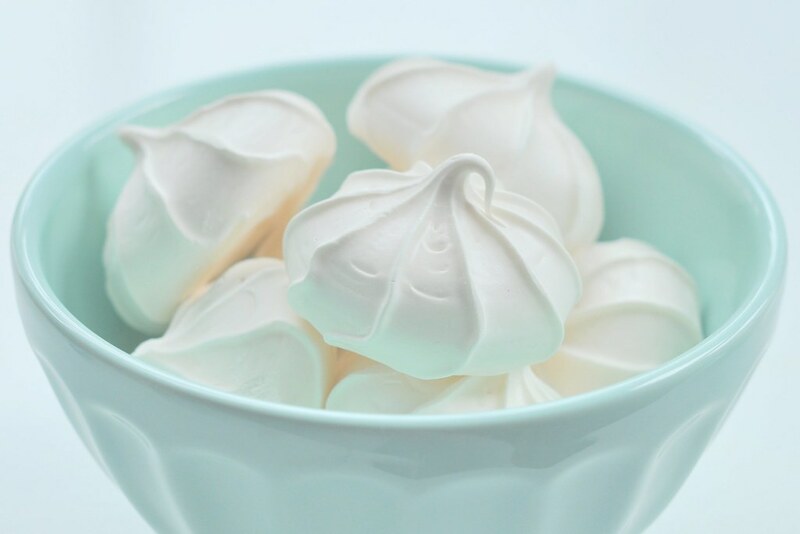 How about we cool things off with a bowl of meringues? Only 27 calories apiece, and I hear they’re good with berries. I like one or two with a cup of java, even when it’s this hot outside. Never really took to iced coffee. This entry was posted in photography and tagged dining outdoors, empty tables and chairs, latté bowl, meringes, summer. Bookmark the permalink. As you know, it is cool where I live. I don’t mind… Those meringues look yummy and the color combination is lovely. 27 calories? That is not a lot. It’s been raining all night and day here, torrential rain and the heat from the weekend is gone, still, I saw today that the sunflowers on the balcony are finally open and some strawberries are ripe as well. You’re growing sunflowers on the deck? Great idea. I don’t have good luck with them–they tend to get powdery mildew, so may be it’s too humid here. Hoping you get a warm autumn, Caroline. It has been so hot. It’s been gross! I went to the zoo Sunday morning and had a snow cone at 10 just to stay cool. It is gross. Either super hot and dry or hot and humid. I am so looking forward to fall! Wow those are amazing pictures, I like them! Did you take those? Luckily for me back in the bay area of CA it’s been in the mid 80s or so with some light breezes, so it’s actually been really nice here. School is starting soon though and the weather seems to shift to colder and darker then for some reason, so I’m not sure how much longer this great weather will last. Thanks so much for all your kind comments, and welcome to the blog! Yes, I take all the photos on my site, unless otherwise specified. I love the bay area! 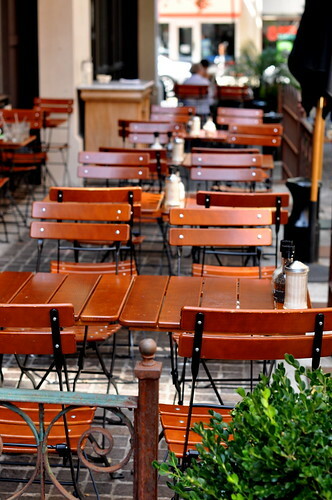 What a lovely restaurant.I want to eat something at this space.It must be fun and enjoyable. Hello, and welcome to the blog! It’s really nice to have a reader from Japan. I am so tired of the heat and humidity. Bring on fall! 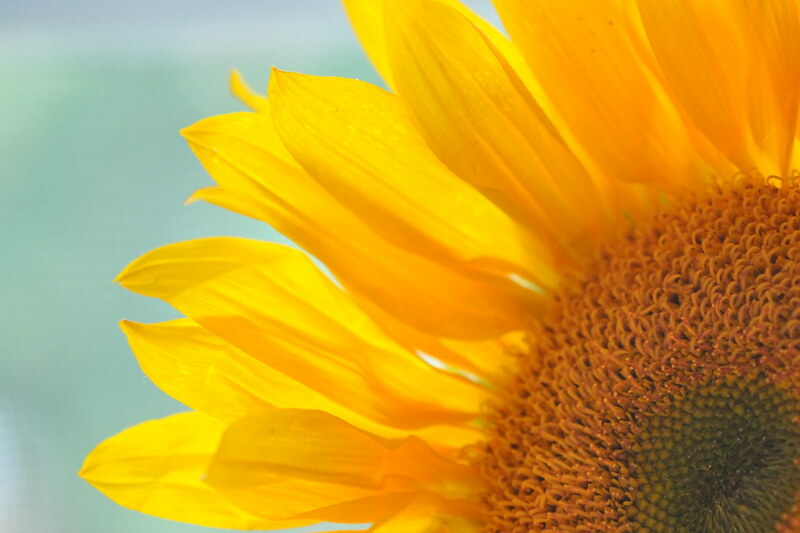 Where was your sunflower when I was looking for one to add to my Shine posts on my blog? 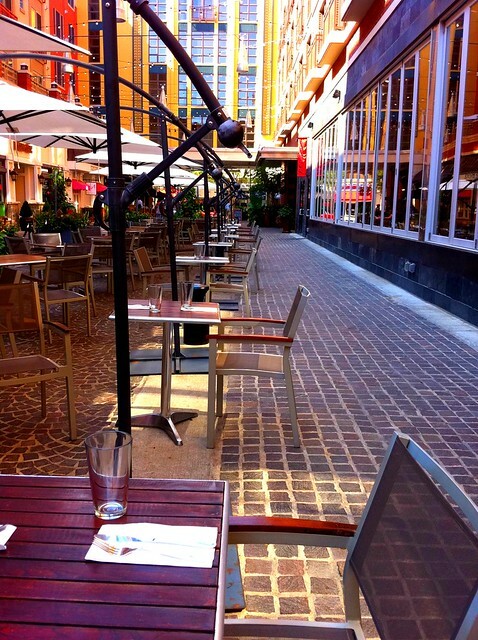 🙂 I see some people eating at outdoor cafes in this heat, but I’m not one of them. Seems so uncomfortable to me. I just saw some people waiting at the bus stop, in the heat and humidity, with no shade. There was also a homeless guy walking up and down the median strip asking for money. Felt really lucky to be in a car. With air conditioning. OMG Carole! Your sunflower macro should be enlarged, framed and hung some place prominent. How exquisitely beautiful! We are just out of a 3 week heat wave, and I’m so relieved … we hit temps (with humidex) in the 40’s celsius. Wow, Cheryl, I was just wondering today how you’re doing with all the construction and the book. Can’t imagine clearing land, etc. in that heat! We set a record in July, so I’m glad it’s over. Sorry you’re having the heat wave too. The first and last photos are just a feast for my eyes.